Imagine that you have a rare weekend without any professional responsibilities: no papers to grade, no lessons to plan, no activities to cover. To take advantage of this unexpected free time, you and three friends decide to go on a fishing excursion to a lake known as one of the best largemouth bass habitats in the eastern United States. Through e-mail messages, telephone conversations, and brief get-togethers, the four of you coordinate transportation, lodging, the time of departure, and other details. It would seem reasonable to assume that you were all going with ambitions to catch largemouth bass. However, what would happen to the trip's camaraderie and outcome if each person's vision of the weekend differed from that assumption? What if one person plans to spot eagles, another is looking for lakefront property, and a third hopes to catch anything that will pull on the line, while you are there for sun and leisure? What is the actual purpose of the trip? What are the goals of the attendees? What does everyone envision for the weekend? Has everyone shared these things with one another? Whatever the context, the point is the same: if a group wants to move forward, it needs to develop an understood, agreed-on purpose. With a couple of word substitutions, you could ask those bulleted questions of any leadership team or department in your school. If the team has a healthy culture, its members would likely give similar answers. Stopping to confirm common goals among the stakeholders will help the team meet its objectives. Developing strong vision and mission statements can help stakeholders in your school reach such a common understanding. A vision is your school's goal—where you hope to see it in the future. The mission provides an overview of the steps planned to achieve that future. A vision is concise and easy to recall, whereas a mission is lengthier and more explanatory in nature. Your school may also want to establish targets along the way to measure progress toward its vision. We begin this chapter with developing your school's vision, because you need to know where you want to be before you can determine how you plan to get there. According to the Task Force on Developing Research in Educational Leadership (2003), "Effective educational leaders help their schools to develop or endorse visions that embody the best thinking about teaching and learning. School leaders inspire others to reach for ambitious goals" (p. 3). Your school must have a vision that all staff members recognize as a common direction of growth, something that inspires them to be better. An effective vision also announces to parents and students where you are heading and why they should take the trip with you. Without a vision, your school lacks direction. As the ancient Roman philosopher Seneca observed, "If a man knows not what harbor he seeks, any wind is the right wind." If you don't have a common, agreed-on destination, then everyone is left to his or her own devices to imagine one—a scenario that results in unharnessed and unfocused efforts, with everyone believing that what he or she is doing is right. A common understanding of the destination allows all stakeholders to align their improvement efforts. And the best part of planning for this journey is that it doesn't cost anything to decide where you want to go. One of the most important responsibilities of any leader is establishing a vision and inviting others to share in its development. As important as the vision is, we have found that keeping it alive throughout the year is not an easy task. For you to get the most out of your vision, you must first remove the barriers from making it an integral, vibrant facet of the school community. What is the need for a new vision? Will I be able to continue doing what I've always done? Why or why not? Do I believe in my school's ability to achieve this vision? Another potential obstacle to creating a powerful vision is the reality that vision statements are often created perfunctorily and lack follow-through. They are usually the result of a directive to "get it done" by a certain date and delivered to a central office supervisor. Such directives often lead to vision statements that have been created in a rush by one person or by a small group of individuals with no input from other stakeholders. Such statements are rarely understood or acknowledged by others in the school, and who can blame them? The process precludes genuine buy-in. Although school leadership must have a vision for the future, it should be used as a way to open up a dialogue rather than be handed down from on high. Don't rush the vision statement; doing so leads to skepticism, stress, and distrust, which will lead to a statement that will eventually be ignored. Because these closed approaches to developing vision statements are incredibly common, most staff members are turned off by the mere mention of the words vision and mission and groan at the prospect of yet another initiative that will eventually be forgotten—that after a flurry of activity, the vision will be shelved alongside the school improvement plan, out of the reach and off the minds of staff members. Because they had little involvement in it, they see no real reason to dedicate themselves to it. If setbacks occur along the way, most will shrug their shoulders because they weren't committed and invested in the first place. You can avoid these obstacles by creating a fresh and meaningful vision statement with the involvement of the entire faculty. The collective force and talent of the faculty is more likely to be realized when there is a common understanding of a shared vision. 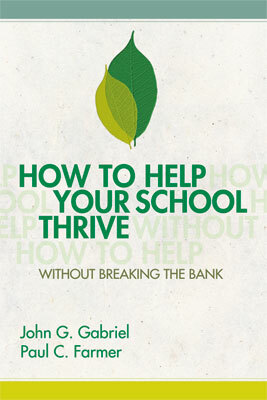 As Bamburg (1994) notes, "The schools that have been most successful in addressing and increasing the academic achievement of their students have benefited from a clarity of purpose that is grounded in a shared set of core values" (p. 14). We define values as the behaviors, beliefs, and actions that a school finds important. Ask yourself, Do I understand what this organization values, believes in, and hopes to be? The size of most schools' faculties prevents them from being as productive or as effective as smaller groups, but their full investment is still crucial. We recommend that you first form a team that, with training and guidance, will introduce the concept of a vision, facilitate and engage faculty in the process of writing one, and synthesize the multiple values and visions that the faculty develops. Ultimately, this team is the one putting together the pieces of the puzzle. This team may be made up of the members of the shared leadership team, or it could be composed of other staff members in the building as long as all departments are represented. Opting for the latter provides leadership opportunities for staff members who are not already formal teacher leaders. For our purposes here, we will refer to this collection of leaders as the vision oversight team. The Richard Montgomery cluster will work collaboratively to ensure all students succeed. Placing the highest priority on reading and writing instruction will support consistent student achievement so that all students attain grade-level or higher performance levels annually, as measured by county, state, and national assessments. Partnerships across the cluster will sustain student success so that all students will read fluently by the end of Grade 2, write proficiently in both narrative and expository modes, pass algebra by the end of Grade 8, pass all High School Assessments on the first attempt, and graduate on schedule with the skills and knowledge required for success in higher education and/or the workplace. Our vision, as a community, is to inspire a passion for learning. All Potomac Senior High School students will achieve personal success in their learning and become responsible and productive citizens. At Brentsville District we believe that all students can learn to their fullest potential. Student learning will be enhanced by national, global, and multicultural perspectives. Graduates will possess the basic knowledge and skills that will assure their proficiency in problem solving and technology. They will be responsible citizens, lifelong learners, and will be prepared for a variety of postgraduation options. We will devote our human resources and technology to create superior products and services, thereby contributing to a better global society. Our vision for the future is to be the customer's first and best choice in the products and services we provide. There is a "Marriott Way." It's about serving the associates, the customer, and the community. Marriott's fundamental beliefs are enduring and the keys to its continued success. What patterns do you see in the statements? What do you like or dislike in the statements? Are the statements too vague, or are they specific enough? Do the statements express an idea or a hope for the future? Are they too unambitious? Too "pie in the sky"? Do they contain adjectives or goals that are more appropriate for a mission statement? Do they clarify a direction for the school and for its improvement efforts? You should also make sure to have copies of your school's current vision statement at the meeting so that participants can compare it with the examples. By discussing the current statement, the sample statements, the bulleted questions, and pertinent articles that you might wish to share as well, the vision oversight team should be able to reach an understanding of what makes a strong vision statement. You might also urge team members to explain to the faculty how the vision is a reflection of the school's values and hopes: it offers an opportunity to dream bigger, so stress to the team that it shouldn't let the faculty develop a "get-by statement," something that expresses a notion of mere adequacy. Tell team members to get the faculty to articulate what it is they truly want from their students and school. Graduation or job attainment is the bare minimum of what most educators hope for their students. The vision oversight team might consider having teachers brainstorm a list of adjectives or values and beliefs that will help them come up with an inspirational, compelling vision. Before you involve the entire school in working toward a vision, you should first share some data with the vision oversight team. Doing so is important for two reasons. First, you want the vision oversight team to be familiar and comfortable with the data; since team members will in turn be sharing the data with the faculty, they should have a strong working knowledge of them so they are equipped to answer questions and help the staff understand what they are looking at. Second, as Bamburg (1994) observes, "Only when schools develop a shared understanding of current reality can a commitment to change be initiated and sustained" (p. 23). Reviewing data as an oversight team and then as a faculty is essential to help everyone identify where the school currently stands while also determining where they would like to be. Without a general understanding of the current data, the development of the vision could go in as many directions as there are opinions. The data provide a common, objective understanding and a solid foundation to build on. Staff attendance rates and days most often missed. Department or grade-level staff absenteeism. Student enrollment in sports or clubs. Disciplinary incidents (including types of referrals and where they occur among teachers, teams, and departments) and dispositions (including detention, in-school suspension, suspension, and expulsion). Advanced Placement (AP) test or International Baccalaureate (IB) test results. Preloading the vision oversight team with these data will give team members the background knowledge they need to develop a vision in collaboration with the entire faculty. It is now time for the vision oversight team to involve the rest of the faculty in developing the vision statement. However they choose to present the examples of vision statements, data, and professional literature, be sure they give staff clear directions, specific questions, and definite time limits; the faculty will quickly discern fluff or a lack of organization, which will immediately turn them off. After they have had an opportunity to review and discuss the above items, they can craft their vision statement (see Resource 5). What evidence can you think of that we are meeting our current vision? What kind of school do we hope to be? What do you think should be reflected in our vision statement? What do we need to do differently to achieve this vision? Key ideas, values, and beliefs are the beginning of powerful visions. Each group should have a scribe whose responsibility it is to record responses, ideas, and key terms and phrases that come up during group discussions. It is not necessary for groups to develop full sentences or statements at this point. After group members have had a sufficient amount of time to share their thoughts with one another, each group should select someone to present the information to the rest of the staff. At this point, you also need to select a "master scribe" to maintain a master list of group responses on poster paper. The master scribe does not need to record duplications or similar phrases, although he or she may add checks or tally marks to indicate patterns or common ideas emerging from the faculty. The groups' presentations are an ideal time to validate responses, affirm staff members' commitment to education, and reinforce key ideas and values. After each group has had the opportunity to share its information, the vision oversight team takes the master list and wordsmiths the key concepts and phrases into a vision statement—a one- or two-sentence statement that captures the faculty's image of the future. Some members of the team will be so excited by the good information they received from working with the faculty that they might find it hard to limit the vision to something so short. If so, you might have them work with the faculty to create a school "philosophy"—a lengthier paragraph that would extrapolate the vision. Next, each department receives a copy of the vision oversight team's draft vision to review, discuss, edit, and return to the team, which then makes appropriate adjustments to the statement. When developing a vision, remember that less can be more; keep it short, and your staff will remember it longer. The vision oversight team then unveils the vision statement to the entire staff at the next faculty meeting. At this point, you should celebrate your staff's considerable accomplishment in guiding school improvement efforts. A mission statement is the wind that brings you to your desired harbor. It guides your travel and powers your momentum. Mission statements "give educators stronger motivation and provide parents with a clearer picture of what the school values. … A clear vision and a common mission that identify the kind of learning to be achieved can help keep the school and the efforts of its staff and students on target" (Peterson, 1995). Mission statements are the "how-to" statements or action plans that help schools achieve their vision. They prompt change and growth. The mission is the touch point that can help you determine whether what should be happening is, in fact, happening. At Battlefield Senior High School, we believe that student learning is the chief priority and all students can learn to their fullest potential. Students will develop their individual talents, critical thinking, and technology skills by being actively engaged in the learning process. Continuous commitment to improvement ensures that our students are well-rounded, self-directed, lifelong learners. By maintaining a safe and optimum learning environment, we provide the opportunity for students to be successful. Promoting high standards and expectations, teachers, administrators, parents, and the community share the responsibility for advancing the school's mission. In order to prepare students to live in and contribute to a changing world and engage in active, lifelong learning, Richard Montgomery High School provides a balanced, varied school curriculum designed to meet the academic, cultural, and social needs of individuals from the diverse backgrounds of our community. John T. Baker Middle School seeks to be an exemplary learning community school. We build the foundation of this community through meaningful relationships, relevant and engaging learning, and effective communication. We challenge ourselves to be better than we think we can be, and advocate for the greater good of our multidimensional community. Our success in this mission will build lifelong, confident learners, who have the tools necessary for success in a changing world. Our mission is to empower all students to apply their acquired skills and knowledge, and to rely upon their personal attributes to lead productive lives and to become contributing members of the global community. Our mission is to provide a high-quality, comprehensive, and meaningful education for all students. Each student will be expected to succeed within the bounds of their abilities and chosen educational goals. Each student will be treated as an individual, given the tools to be a lifelong learner, and taught to function as a member of a group and as a productive member of society. Are the statements specific enough? Do the statements simply state a belief, or do they express a purpose for existence? Do the statements clarify what action steps students and staff will be expected to take to achieve the vision? Do the statements clarify how staff will engage in improvement efforts? The mission statement should encompass the values of the staff, the actions that the school will take, and the areas it will address (e.g., curriculum, assessments, data) to achieve its vision. The mission statement should be longer than the vision statement because it is a specific plan for driving the school to fulfill its potential (see Resource 6). After the faculty has worked on the mission using the same procedures they used in developing the vision, the mission oversight team again attempts to blend key words, phrases, and concepts into a viable statement. During this process, they need to ensure that the mission they are crafting aligns with the new vision statement—specifically, that the steps, actions, and values stated in the mission are things that will help them achieve the vision. The relationship between the mission and the vision must be clear. After the mission oversight team has completed the draft, it is sent back to the faculty for review and discussion. Then the team meets again to review the feedback and make necessary adjustments before a final unveiling to the staff. After the school has adopted the final drafts of both the mission and the vision, invite multimedia or art classes to design posters prominently displaying the statements. Soliciting these classes' assistance saves money and is a good way to make the vision and mission a meaningful part of students' lives. The vision and mission should be sent home in newsletters and posted in prominent gathering places throughout the school—classrooms, the mailroom, the lunchroom, and so on—to keep it at the forefront of people's minds. Repetition, design, and placement are strategic ways to keep the mission alive. The school's next step is to devise a plan to fulfill its mission. The SMART format—a widely used method for developing goals in schools and businesses—provides a framework for developing goals and action steps to help you focus on what really needs to be done. SMART stands for Specific, Measurable, Achievable, Relevant, and Time Frame. Figure 2.1 demonstrates the difference between traditional goals and progressive SMART goals. You can use this table as a guideline to develop your goals, checking to make sure that they meet the five parameters. The passing rate of limited-English-proficient students will increase from 79 percent to 85 percent on the Algebra I Standards of Learning (SOL) exam in 2008. This goal needs more specificity. Which students from our population will improve? What aspect of their achievement do we want to see improved? Marking period grades? Final course grades? Standardized test scores? The desired outcome is unclear. This goal identifies a subgroup, a subject, and a target population and clearly defines the desired outcome. We could even break this down further by identifying a tested strand on this SOL. "Improve" is difficult to quantify. What does it really mean? By how much do we want achievement to improve? This goal is measurable. It clearly identifies the starting point as 79 percent and the minimal acceptable value as 85 percent. This goal seems achievable. But we do not really know because the goal does not define what it means by "improve." You can gauge whether a goal is achievable by asking yourself if the goal is pushing you beyond your limits or if it is something you can accomplish if you stretch yourself. A goal of improving to a 100 percent passing rate in one year would not be reasonable, but a 6 percent increase is. Is this goal relevant to the school's vision and mission? We can't tell because the goal is not clear on how it relates to them. This goal is relevant because it has identified a specific area of need. It is standards-based and directly addresses academic achievement. What is the time frame for reaching this goal? We have no idea whether it's a short-term goal or a long-range goal. The end date for this goal is the 2008 main testing window. After creating your goals, the next step is to develop SMART action steps—tasks or activities that you will engage in to achieve the goals. Figure 2.2 depicts an action step developed to help meet the SMART goal in Figure 2.1. Teachers will incorporate foldables and graphic organizers into their Algebra I class to reinforce new terminology. The action step names two specific strategies and clearly states expectations. Teachers can measure their application of the strategies against lesson plans or team minutes. The strategies are achievable because teachers on the Algebra I team who know how to use foldables and graphic organizers agreed to share their expertise with the rest of the team. This is a relevant action step because achievement has been low and limited-English-proficient students have expressed difficulty learning the vocabulary in Algebra I. These strategies will be incorporated when new terminology is introduced in the class. Who will be affected, who is responsible, and who will participate? Who is the audience, and who are the stakeholders? What needs to be done? The "what" should be in direct relation to the purpose. When will this take place? When will we know we are done? When can our progress be measured? How will it be measured? How will you know it was successful? The school improvement plan (SIP) is the tool that will help you get the most out of your vision, mission, and goals. It is a more detailed document than the mission and vision statements. Like the mission statement, it falls within the scope of the vision. The SIP is a blueprint for the school's progress toward its goals. It helps propel grade-level teams, curriculum teams, and departments toward meaningful improvement. It provides detailed expectations for administrators, teachers, counselors, and other stakeholders and includes specific plans that guide improvement efforts throughout the year. Although the majority of school improvement plans focus on improving student achievement through such measures as high-stakes tests, advanced placement exams, and the SAT, we recommend enriching the document to include several areas outside the realm of assessment. For example, you might add a section about improving student attendance or reducing the number of disciplinary infractions. You could seek to increase participation in extracurricular activities and athletics and improve the delivery of student services offered by the guidance department, the career center, and the library. Use your SIP as an opportunity to develop goals, plans, and actions to improve all facets of your school's life. If we ask students to create a plan for their improvement, we should be open to doing the same for ourselves. Make sure the plan includes a proposal for staff development. If teachers aren't learning and growing, it is not likely that students are either. An improvement plan is only useful when it is doable. All goals that are developed by each department in the school should fall under the umbrella of the school system's goals and objectives; if not, you could be trying to do too much or go in too many directions and will end up accomplishing very little. The SIP should help you not only look forward but also evaluate what has been done in the past. Without such reflection, your efforts will be random, unfocused, and unsupported. A high-quality school improvement plan is essential for establishing and maintaining a healthy culture. Because of its importance, the shaping of and responsibility for the SIP must not rest in the hands of a select few. In successful schools we have worked in, a group of representative staff members referred to as the SIP team is assigned to work with school staff to identify areas of need and develop action plans, which are the specific steps and tasks articulated to achieve the stated goals. The SIP team typically consists of department chairs, team leaders, administrators, a parent representative, and at least one support staff member, such as a secretary or an instructional assistant. However, we recommend involving potential teacher leaders in the development of the SIP as well. You should conduct the selection process for the SIP team each year to allow everyone the opportunity to participate. In some schools where we have worked, these positions were highly sought after because they offered opportunities for professional growth. We recommend that the team include stakeholders who will be affected by the content of the SIP. At the very least, the team should include a representative from each department, whether it's the department chair or another staff member (although we do not suggest recruiting a novice teacher). The representative does not hold sole responsibility for developing his or her department's portion of the SIP; rather, he or she facilitates the collection of the information that the department will include. The representative is expected to conduct meetings with department members to discuss what should be included in the SIP, establish deadlines for submitting this information, polish the information, and return it to his or her departmental colleagues for final approval before submitting it for inclusion in the school's master SIP document. Cover page. This should include the title, your school's name, and the date. Committee member list. This should include the name and title of each member of the SIP team. State department vision and mission statements. Most state departments of education have a published vision and mission. School system vision and mission statements. Most school systems have a published vision and mission. The school's vision and mission statements. The overarching components of the school's vision and mission should fall within the parameters of the school system's vision and mission. If the school system does not have vision and mission statements, we still recommend that your school develop its own. School details and demographics. This includes school statistics on ethnicity; gender; English proficiency; economic status; educational designation (e.g., general education, gifted, special education, and twice exceptional); graduation rates; percentage of last year's students who enrolled in a two-year or four-year college or trade school; and enrollment in AP/IB courses. NCLB AYP Report Card or High-Stakes Report (depending on the state). If provided by the state, include a report of the most recent AYP results for your school by subject, grade, and subgroup status. School system goals and objectives (if available). These are typically created by the school board and/or the superintendent's office. They may be referred to as objectives or targets, among other descriptors. SIP calendar. The calendar should include the dates and times when the SIP team is expected to meet and when it is expected to deliver content and evidence of efforts and completion. Departmental goals. These goals focus on improving student achievement or delivery of services (for example, from the guidance department, the main office, and so on) specific to each department or team. Indicators of achievement. These are specific indicators or results that will be reviewed to determine effectiveness. Areas of focus. These include specific content areas, skills, standards, anchors, populations, and services that are targeted in the SIP. Action plans for each department or grade-level team. Each department's specific action plan includes data sources, point of contact, potential costs, staff development efforts, required materials, activities, and time line to put the action plan in place and measure its effect. The sections of the school improvement plan that are specific to individual departments and grade-level teams should provide focus for each of the areas with regard to content delivery. For example, in our version, items 10–13 would include any department in the building. In this case, we use the math department as an example, which might have an overall goal such as "Student passing rates on the Geometry Standards of Learning [Virginia's year-end high-stakes assessment] will improve from 81 percent to 86 percent in the following year." In some cases, the goal may target certain populations, such as "The percentage of African American students successfully completing geometry will increase from 73 percent to 80 percent by the end of the following school year." Departments and grade-level teams should measure their efforts and indicators of effectiveness against these goals on a monthly basis to obtain objective information to fuel their discussions. We purposely mention "areas of focus" in item 12 to hone efforts and add value to departmental discussions about curriculum delivery. In this section of the SIP you would find statements such as "During the 2008–2009 school year, the mathematics department will increase focus on (1) patterns, functions, and algebra and (2) numbers and number sense." At least once a month, the department or team should assess the extent to which its content delivery hit these specific areas of focus. When the SIP is finalized, it should become a public document, accessible to all staff. Posting the SIP electronically will save paper and photocopying expenses, although you might want to divide the document by department or team and print a hard copy of each section. We encourage schools to conduct quarterly reviews of the SIP and periodically monitor their progress. Item 13 of the SIP includes timelines for completion and evidence of attainment. These checkpoints are a good time to assess the extent to which teams are following through on their action plans. Waiting until the end of the year to conduct reviews will prevent staff from making needed changes along the way, and the following year may start with a stagnant, less-than-effective SIP. Vision and mission statements provide schools with an essential overview of where they want to go and what they want to be. Few thriving schools or companies attained their success without developing such statements as elements of their school improvement plans or business plans. But merely drafting statements is not enough. To realize your school's vision and mission, you must model your school's beliefs, values, and collective commitments while demonstrating enthusiasm for what will come next. Perhaps most important, your vision and mission establish clear expectations and standards for your staff. We further discuss how to get the most out of your staff in the following chapter. Identify and train vision and mission oversight teams. If there are existing vision and mission statements, review them to determine their relevance and accuracy. Devise a meaningful plan to involve the staff in either revising the existing vision and mission statements or creating new ones. Ask probing questions to guide staff in developing their vision and mission. Use data to identify areas that need improvement and establish SMART goals. Recruit members for a school improvement plan team.